The holidays are almost here, and clients are getting excited about their upcoming celebrations. Among the best ways to transform a room from everyday okay to seasonal sensation is to choose the perfect rentals. These are some of the year’s highly anticipated must-have rentals for the season. Glitz and gold are timeless and traditional choices for winter gatherings. Gold chairs, especially, are forever in high demand, as are the classic seasonal color combinations in linens: red with green, and blue with gold or silver. Instead of starting with your standard polybases on tables, though, choose rich fabrics that are ideal for cooler temperatures, like velvet. It’s not only a top annual request, but it is also among this year’s hottest trends, too! Speaking of trends, metallics and jewel tones are hugely popular right now. Instead of choosing a basic red, think burgundy or emerald green. 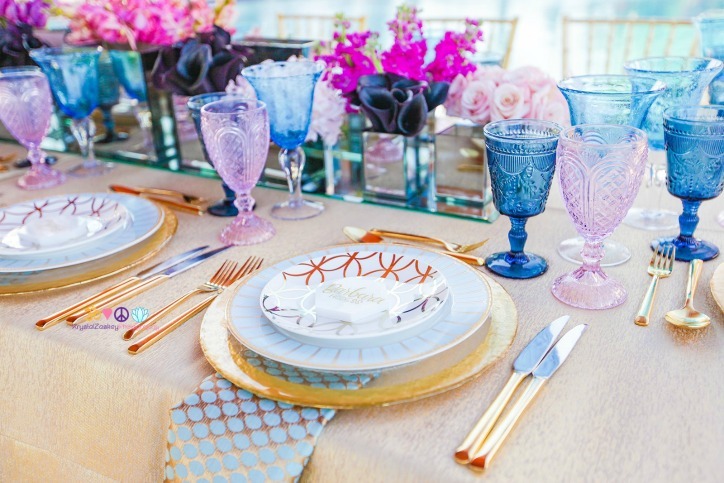 Sequined linens are among clients’ top requests, prized for their glitz as well as their texture and weight, and how they add to the overall aesthetic of luxury and glamour. Pair them with heavyweight velvet or corduroy, or place settings of silver and gold to invoke a seasonal feel without the trappings of colors usually associated with specific holidays. Did you realize you can make a bold statement with an upgraded dance floor? Forget old-fashioned parquet, or just using the standard space on the floor available at your venue. Choose a remarkable, stylized dance floor, such as one that’s round, gray-washed, black-and-white, or that features designs. Make your dance floor a focal point of your party or reception. Often the difference between ordinary and extraordinary is in the tiniest details. Don’t rent china to set your guest seating apart, and then use standard flatware. Coordinate them, and include a charger to round out the total picture. Also, don’t neglect to order specialty linens for bars, buffets, gifts, registration, and display tables. You lose the opportunity to make an impact when you go all out for guest seating but only use basic linens with aging skirting on the rest of your tables. Bring a floor plan with you to your rental consultation, so you don’t leave anything out. Holiday celebrations should be fun, festive, and memorable. Don’t shy away from something new or unique just because your client starts with a traditional picture in mind. Be prepared to demonstrate the way great rentals can elevate an event to new heights and help create a fantastic experience for your hosts and guests alike.